Roemer van Toorn went to Venice Italy to NEXT the 8th architecture Biennial and wrote down his thoughts concerning the Dutch pavilion. 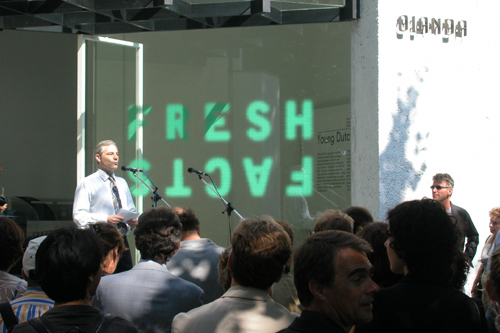 When I saw the Dutch pavilion I was pleasantly surprised to see it featured the word 'Fresh' in its exhibition title. It reminded me of my article 'Fresh Conservatism', in which I expressed reservations about the seemingly progressive zest of many Dutch designs. I thought it a good choice of title of course, since in the Netherlands we draw inspiration from facts and we do it in a 'fresh' manner. In his opening speech Aaron Betsky rightly pointed out that Dutch design talent is certainly not on the wane, despite what many foreign observers claim. 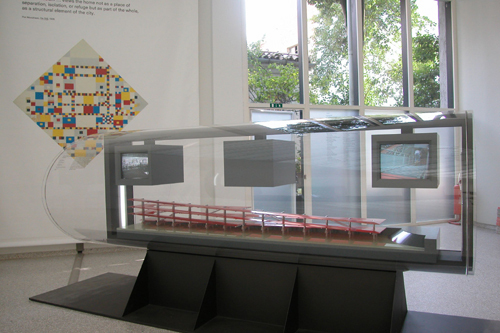 Betsky went on to say that Dutch architecture, unlike that in many other countries, has a strong social tradition. Form is not treated in isolation but in terms of social experience, as the ongoing involvement in housing illustrates, said Betsky. And he's right, but I still had the impression that the relation between form and experience remained unexplored in this otherwise wonderful exhibition. Everything about it is so professional and perfect and so smoothly presented that the beauty of the architecture captures all the attention. 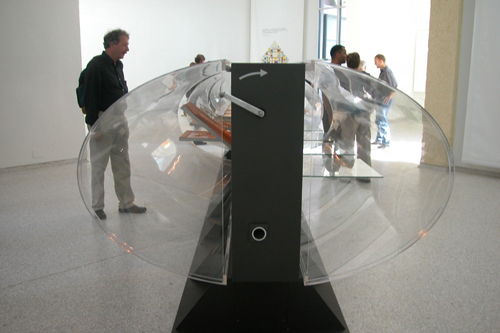 This is an exhibition about good taste; what design activates comes off a poor second. A first reading of the Mondrian quotes from 1929 – chosen by Hertzberger, Betsky and Rudi Fuchs and projected onto large screens in the exhibition – might seem to contradict my view. 'Not to be concerned with form and colours-as-form – this is the new plastic in art. Not to be overdominated by the natural-physical – this is the new mentality. To focus exclusively on relationships by creating them and be searching for their equilibrium in art and in life – this is the great work of our time: to prepare the future.' True, architecture is about the relations it establishes with life (certainly in the Dutch tradition). But if we don't stop and ask what type of equilibrium is being pursued, what particular relations a (Dutch) design seeks to establish with reality, then we soon end up churning out all the usual superficial conclusions. The consequence is that talented design ends up hogging the limelight while we lose sight of the complex and critical relations that a design establishes with the social world. Never before were Mondrian, Rietveld, Hertzberger, MVRDV, René van Zuuk, VMX, NL Architects and Korteknie Stuhlmacher so wholeheartedly in agreement with one another. We won the Golden Lion of course, but I still expected a Dutch submission with a little more guts. 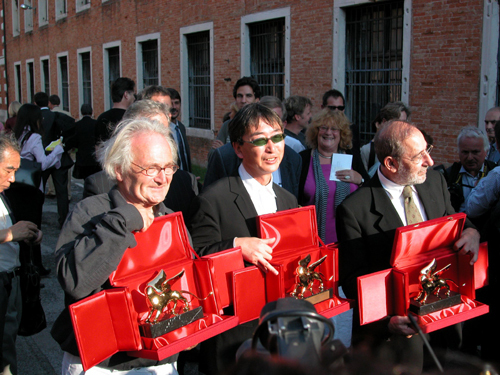 1: Aaron Betsky, Toyo Ito, Alvaro Siza and Herman Hertzberger. 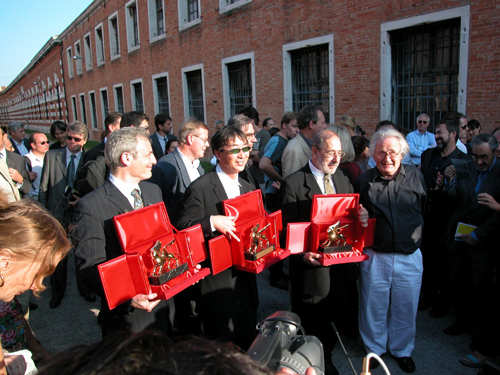 As designer of the Dutch submission, Hertzberger wants to accept the award.